Luther Yonger, 99, walks and even runs to see his wife, who is suffering from cancer, at a Rochester hospital. 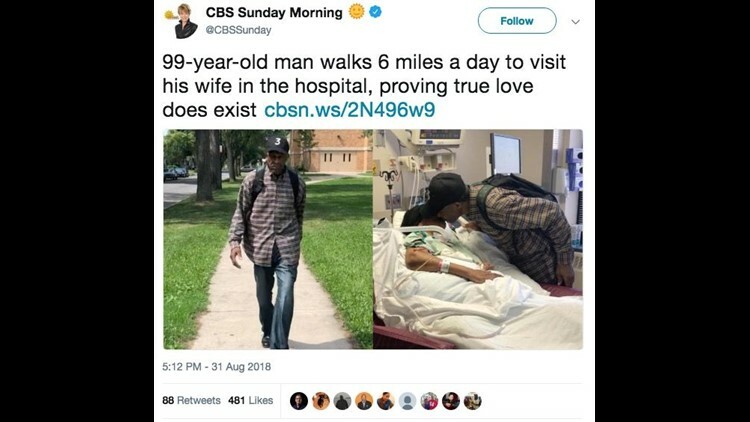 The world fell in love with Luther Younger last month, when a report surfaced out of Rochester, New York, about a 98-year-old veteran who walks three miles to see his wife in the hospital every day. Recently, a CBS reporter who joined Younger on one of his treks even reported the older man running to the hospital. While Younger appears devoted and in love with his ill wife, the Rochester (N.Y.) Democrat and Chronicle, part of the USA TODAY Network, found inconsistencies with Younger’s story. CBS News reported Younger is now 99, but his voter registration form lists his birthday as Aug. 31, 1941. By the accounts of his relatives and available public documents, Younger is 77. Younger still insists he is much older, saying he was assigned that date because he doesn’t have a birth certificate. The Texas State Library and Archives, which has kept birth records since 1903, has nothing on Younger, the Democrat and Chronicle found. Neither Younger nor any of his relatives contacted by the Democrat and Chronicle could recall his wedding date with wife Waverlee, but they said it was in the 1980s. So, it’s more likely the pair has been married about 35 years, not the more than 50 previously reported. Relatives confirmed Younger, who does not have a driver’s license, did regularly walk six miles a day to see Waverlee during her recent four-week stay in the intensive care unit at the hospital. He lives about three miles from the hospital, and has access to transportation but mostly walks, relatives told the Democrat and Chronicle. “The love story is for real, mister,” Younger told Democrat and Chronicle reporter David Andreatta. Waverlee was indeed diagnosed with a malignant brain tumor in 2009, relatives confirm, and is now being cared for at home. Younger’s family also says their love is true. The Spectrum News in Rochester reported Younger is a a Korean War vet. The CBS report referred to Younger as a marine. Yvonne Carlock, a spokeswoman for the Marine Corps, told the Democrat and Chronicle there was no record of a Luther Younger serving in Korea and the only record of a Luther Younger in the Marines was a 70-year-old who enlisted in Jackson, Mississippi, and served in Vietnam from 1967 to 1971. More: Baby boomers' divorce rate skyrockets: Keep hold of your marriage.